Senior U.S. officials will soon brief allies on plans to withdraw from a bilateral nuclear arms control treaty with Russia in the wake of repeated violations by Moscow, the nation's top intelligence officer said Tuesday. Director of National Intelligence Dan Coats told reporters he will speak with European partners during this week's NATO summit in Brussels to address the threat posed by Russian violations of the 1987 Intermediate-Range Nuclear Forces Treaty, or INF. The Trump administration announced plans to withdraw from the agreement last month, but they have not yet laid out a timeline to formally exit the deal, Coats said. "We are still pursuing this issue relative to working with our allies, particularly Europeans," he said. The INF treaty bars the United States and Russia from possessing ground-based ballistic missiles with a range of 500 to 5,000 kilometers (300 to 3,400 miles). The United States has alleged Russian violations of the agreement since 2014. 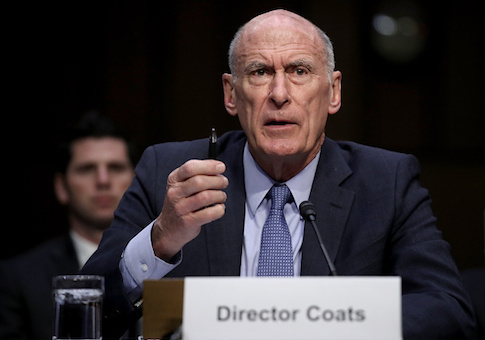 "The intelligence community assess Russia has flight-tested, produced, and deployed cruise missiles with a range capability that are prohibited by the treaty," Coats said. "Russia has shown no sign that it is willing to acknowledge its violation, let alone return to full and verifiable compliance." He pointed specifically to Russia's "covert development" of an intermediate-range ground-launch cruise missile called the 9M729 that the United States has said exceeds the range allowed by the INF. Russian has denied the violation. Coats said there's a slim chance the United States could remain in the agreement if Russia acknowledges they've violated the treaty and destroys the illicit missiles—a path Coats said "doesn't look all that promising." U.S. allies, including the European Union, broadly opposed President Trump's announcement to leave the treaty and have warned that doing so could provoke a nuclear arms race. Coats rejected the censure. "If you've agreed on a treaty and it has been successful in destroying a number of missiles … but then you find out your partner is cheating and they want to keep the status quo of their cheating going forward and keep their advantage strategically in place while we are adhering to the treaty, that doesn't spell well for this treaty going forward," he said. This entry was posted in National Security and tagged European Union, Nuclear Weapons, Russia. Bookmark the permalink.